Dancing with the Stars ... It all started back in 2004, in England. The fever of the popular TV show spread quickly throughout the world, and thus also in Croatia. One of the most watched TV shows finally paid tribute to dance and put it in the long deserved place - the place of great skill and art! It is an exceptionally positive show, full of beauty and glamor, always greeted with joy. We are very proud of Nicolas Quesnoit - Croatian Frenchman, our most beloved, charismatic, optimistic, probably the most memorable winner of the first Dancing with the Stars TV show. We are also proud of our top dance students, today's dance teachers and professionals who successfully participated in Dancing with the Stars TV show and represented The Zagreb Dance Centre by Nicolas, where they had the opportunity to learn from Ksenija and Nicolas, their best dance instructors. 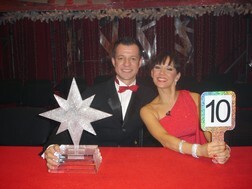 The Dance Centre Zagreb You are our star, and we Your professionals!